WEDO is a global advocacy organization established in 1991 by former U.S. Congresswoman Bella Abzug (1920-1998) and feminist activist and journalist Mim Kelber (1922-2004). It grew out of an extraordinary group of women, including Bella and Gloria Steinem, who started Women USA in 1979, and became the organization it is today through the vision of WEDO pioneers, Wangari Maathai, Vandana Shiva, Thais Corral, and many others. In 2011, WEDO celebrated its official 20th anniversary! 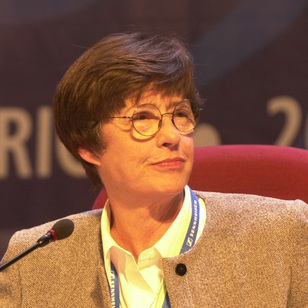 WEDO has been a leader in organizing women for international conferences and actions, earning a reputation as a trailblazer in the international women’s rights movement. Read more of our history on our website. WEDO recognized that the hard-won policy commitments to women’s rights that emerged from the major UN conferences of the 1990s were not enough to improve women’s daily lives. WEDO has spent the last few years focused on deeper collaboration with Southern partners to increase the number of women leaders at all levels, to implement global policy gains at the national level, and to hold governments accountable to their commitments on women’s rights. Headquartered in New York, WEDO is a registered non-profit organization under Section 501 (c) (3) of the Internal Revenue Code of the United States and is an accredited non-governmental organization with the United Nations. WEDO programs receive financial support from government and UN donor agencies and partners, individual donors, and foundations. In 2010, WEDO was awarded by the National Council for Research on Women (NCRW) for outstanding advocacy to integrate a gender perspective into climate change arenas. Following the UN conference on Environment and Development (UNCED), Bella Abzug and Mim Kelber, recognizing the need to bring women's voices into the environmental agenda, mobilize 50 female leaders from 31 countries to form the International Policy Action Committee in October. WEDO members and over 1500 women from 83 countries gather at the Women's World Congress for a Healthy Planet in Miami, Florida providing testimonies on how the environment and development crises impacted women. Out of this meeting, a consensual agenda called Women's Action Agenda 21 is born. WEDO wins a new pledge for gender balance in the Commission for Sustainable Development (CSD) and becomes convener of the Women's Major Group. WEDO organizes the women’s caucus at the UN conference on Population and Development in Cairo – the final outcome of which expanded the frontiers of action for women’s development further than any previous UN document. WEDO organizes the Linkage Caucus at the Fourth World Conference on Women in Beijing. 89 percent of the Caucus recommendations were incorporated by the final Beijing Platform for Action and almost two-thirds were accepted. Bella Abzug is honored by the UN and NGOs worldwide with a UN Peacekeeper’s Beret for her work as both ‘A Fighter and a Peacemaker’. WEDO launches the campaign 50/50 by 2005: Get the Balance Right! in June 2000 during the UN Beijing+5 Review session, bringing together women leaders from all regions to learn from each other’s experiences and develop national and local strategies. WEDO's long fight for women inclusion records a breakthrough when CSW adopts agreed conclusions on environmental management, including a comprehensive set of policy recommendations to enhance women’s empowerment and promote gender equality in situations of natural disasters. After the drafting of a Gender Plan of Action by WEDO and IUCN in 2005, WEDO is recognized with the Champion of the Earth award by UNEP. Following almost 20 years of lobbying and awareness-raising of women issues, WEDO is honored for its work on gender and climate change by the National Council for Research on Women (USA) with its 2010 Advocacy Award. WEDO and its partners mobilize awareness in support for a women’s rights-based post-2015 agenda via participation on the global Rio+20 summit, co-leading the work of the Women's Major Group. WEDO, alongside women's groups, monitor, track and fiercely advocate to enshrine gender equality and human rights language in the Paris Agreement, a key goal on Gender Equality, and mainstreaming of gender in the SDGs, as well as engage in massive movement building with women's rights advocates. WEDO conducts training's for over 100 women environmental leaders on the climate change process, and after years of engagement and advocacy in the UN climate process, sees the launch of the first ever UNFCCC gender action plan (GAP). A passionate perfectionist and risk-taker, Bella S. Abzug was born on July 24, 1920, one month before U.S. women won their long struggle for the right to vote. 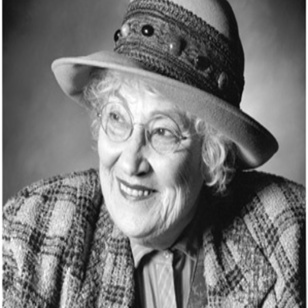 Recognized early as a natural leader, Bella S. Abzug lived to become one of the 20th century’s great women leaders. She was honored and loved for her championship of the world’s women, human rights, the poor and oppressed, and most of all for her people-nurturing vision of a healthy, peaceful planet. Admirers and foes alike praised her for her brilliance, honesty, principles and dedication to women’s empowerment and democratic values. Co-founder of WEDO, Mim was a noted journalist and feminist. She was a co-founder of Women Strike for Peace and a speechwriter and policy advisor for Bella Abzug (they were high school and college classmates) during Bella’s years in the U.S. House of Representatives. Mim served as policy director on President Carter’s National Commission on the Observance of International Women’s Year and a chief writer and editor of the Spirit of Houston Report. She wrote numerous magazine and newspaper articles on feminist and political issues, and was co-author of “Bella Abzug’s Guide to Political Power for Women” (1984). As a WEDO board member and its editorial director (1991-98), she was a co-editor and writer for News and Views (insert link) and also chief writer of a book “Women and Government, New Ways to Political Power.” Among Mim’s accolades and awards are the Ms. Foundation’s Wonder Women Award (1984) and a Feminist Majority Foundation’s year 2000 award for outstanding leadership. Thais is the founding director of the Network for Human Development, an NGO dedicated to bringing women’s perspectives to development issues in Brazil. She is also co-founder and former vice president of the international Women’s Environment and Development Organization (WEDO), and the founder of Communication, Education, Information on Gender, a Brazil based NGO. 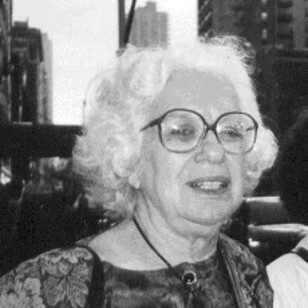 In the 1990s, Ms. Corral represented the interests of women and civil society at various United Nations Global Conferences. Trained as a journalist, Ms. Corral created a radio conglomerate of over four hundred radio stations in Brazil that promote grassroots activism and adult education. Thais conceived and coordinated a training program to integrate issues such as environment, human rights, sexual orientation, and race and ethnicity in the curriculum of adult education in Brazil. She is also a board member of Leadership for Environment and Development International (LEAD) and recipient of numerous awards. 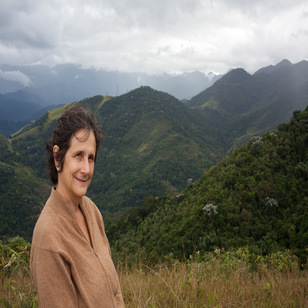 An activist at the national, regional and international levels, Jocelyn Dow is the founding member and Executive Director of Red Thread, a womenís collective in Guyana. She is also former WEDO Board President. As a businesswoman, Dow is committed to environmentally sound development, exemplified in her furniture company, Liana Cane Interiors, which is based on the sustainable use of non-timber forest products. 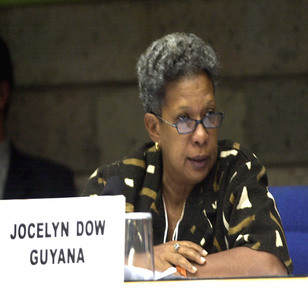 Dow has served as a former board member of the Caribbean Conservation Association and as a Member of the Guyana Elections Commission and of the External Gender Consultative Group of the World Bank. She has been a member of the Guyana Elections Commission and of the External Gender Consultative Group of the World Bank. In September 2002, she was appointed to the United Nations Secretary Generalís Panel of Eminent Persons for the World Summit on Sustainable Development in Johannesburg. 2004 Nobel Peace Laureate Wangari Maathai is the founder of the Green Belt Movement, a women-driven grassroots reforestation and sustainable development movement that has planted more than 40 million trees; its 3,000 tree nurseries are managed by some 60,000 women and 1,500 men. Maathai, a former WEDO board member, was an elected member of Parliament and served as Assistant Minister for Environment and Natural Resources in the government of President Mwai Kibaki from 2003 to 2005. 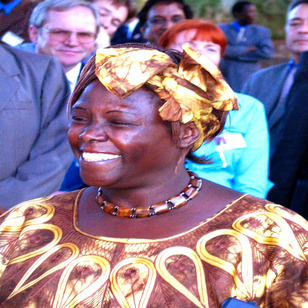 A biologist, Wangari was the first Kenyan woman to earn a PhD, to teach and chair a department at the University of Nairobi; an environmental and sociopolitical activist, her numerous awards include the Goldman Environmental Prize, the Africa Prize for Leadership and the UNEP/Eyes on the Environment Award. Maathai is a co-founder of The Nobel Women’s Initiative, whose goal is to support women’s rights around the world. Her autobiography, Unbowed: One Womanís Story, was released in 2006. Activist, founding member of Women USA and Women USA Fund from which WEDO was organized, member of U.S. Women Connect, the National Congress for Neighborhood Women and GROOTS International. Brownie also worked locally in Arkansas for 30 years as founder of three nonprofit organizations and executive director of one, the Arkansas Public Policy Panel. Brownie was staff or consultant in many Arkansas political campaigns in the 60′s and 70′s including campaign manager for McGovern in 1972. She was Political Action Chair of the National Women’s Political Caucus from 1973-75 and on President Carter’s Commission on Women. She organized the first Planned Parenthood Affiliate in Arkansas in 1986 and directed the campaign that defeated the first ballot effort to prohibit the private and legal choice Arkansas women have for some forms of birth control and abortion in 1985. Chief Bisi was founder and national coordinator of Country Women Association of Nigeria (COWAN), a rural women’s self-help organization operating in 25 states of Nigeria, with 24,000 working groups representing 120,000 members. She was also founder and president of the Network of African Rural Women’s Association; vice-president of the Forum of African Voluntary Development Organizations; board member of PACT and the United Nations Earth Council. In 1996 Chief Bisi was awarded the Africa Prize for Leadership by the Hunger Project. A former WEDO board member, she has served as co-chair of the Microcredit Summit Council of Advocates. Scientist, philosopher, feminist, author, environmentalist, activist, Dr. Vandana Shiva is a one-woman movement for peace, sustainability and social justice. 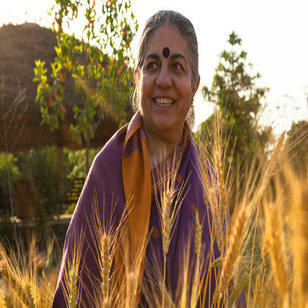 Vandana Shiva was born in 1952 in Uttarakhand, India . Her father was a conservator of forests, and her mother was a farmer with a deep love for nature. Her parents were staunch supporters of Mahatma Gandhi, and Gandhi remains a profound influence on her thought. Echoing Gandhi, she says, “I have tried to be the change I want to see.” In 1991, Dr. Shiva founded Navdanya, a national movement to protect the diversity and integrity of living resources, especially native seeds, and to oppose what she calls the colonization of life itself under the intellectual property and patent laws of the World Trade Organization agreement.